Our youngest daughter recently had a friend for a summer sleep over and before I tucked the two little ones into bed (knowing it would probably be some time before they actually slept) I read them some family favorites hoping to encourage some sleepiness. One of my all time best loved children’s books is The Wreck of the Zephyr by Chris VanAllsburg. While VanAllsburg is most popularly know for The Polar Express, it is my humble opinion that his previous works surpass his Christmas tale in both substance and artistic richness. If you’ve never read this gem, check it out of the library soon, or find a used copy online. The artwork alone is stunning, and the story is subtle and clever for the close reader. It involves a young aspiring sailor (in a gorgeous, but simple New England seaside town) who has quite an amazing adventure which I won’t spoil for you. The other VanAllsburg title that we’ve loved forever is Jumanji. Both these stories have great twists at the end that will intrigue the young reader. We also pulled out Madeline, as our little friend had never heard of the precocious French orphan who has captured the hearts of little girls for over half a century! Each book of the series begins with, “In an old house in Paris, that was covered with vines, lived twelve lit tle girls in two straight lines . . . the smallest one was Madeline.” The author, Ludwig Bemelmans had a life as colorful as his protagonist, and incidentally, his wife’s name was Madeleine. 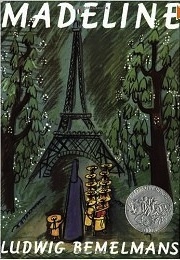 Madeline’s Rescue, the second book in the series won the Caldecott Medal in 1954. 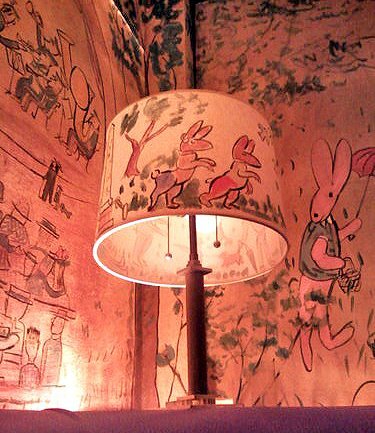 For those who live near New York City or visit it regularly, one of the city’s most famous hotels, The Carlyle has a mural painted by Bemelmans in its Bemelman’s Bar. It is the artists seasonal depiction of New York’s Central Park and includes the characters from his delightful stories. Fortunately, when the hotel was planning to remodel and forever lose Bemelman’s work, it was Jacqueline Kennedy Onassis that came to the rescue of this delightful work of art.